In today’s STEMdaily, a conference at the University of Hawai’i-Hilo aims to strengthen Pacific Islander pipeline into STEM, curriculum and reviews for some excited new STEM toys, STEMconnector CEO Leslie Cruz launches new blog series, University of New Mexico STEM Collaborative Centers seeks mentors, an AI-powered bot mentor for young black professionals gets pitched to Facebook, and more STEM news on higher ed, K-12 grants, and an Iowa teacher training program! The University of Hawaiʻi at Hilo hosted a conference in January for educators from Hawaiʻi and 10 Pacific Island nations who are working towards encouraging students from underrepresented populations to pursue careers in STEM. 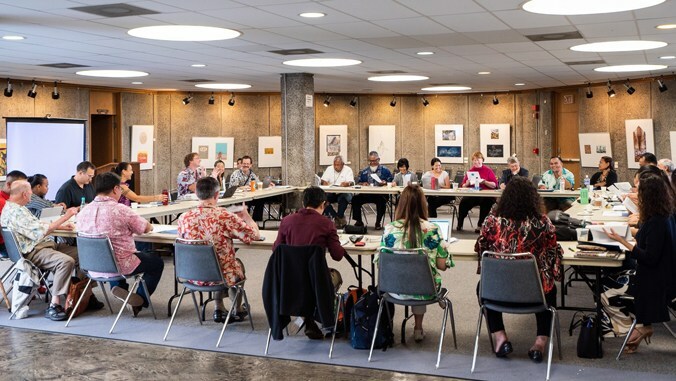 At the conference, the Islands of Opportunity Alliance (IOA), led by the UH Hilo chancellor’s office, kicked off their 2019 STEM mentorship programs, which are funded by $600,000 of a continuing $4 million grant from NSF. Each day in October, Chelsea Cranford would finish her homework and then power up Chatfuel, Facebook’s platform for creating chat bots. Chelsea, working alongside fellow Hartford teens Natalee Best, Elyece Patterson and Angelique Phillips, was building something the team found lacking in their community, a resource for young, black professionals navigating their first workplace. The students, members of Hartford educational nonprofit Girls for Technology, was building EBONI, an artificial intelligence-powered digital mentor with guidance on everything from how to dress and wear black hair in a corporate office, to how to cope with microaggressions from coworkers. K-6 Newcomer Academy is a recipient of Pennsylvania’s first-ever dedicated computer science funding, Allentown School District’s communications office said Tuesday. The PAsmart Targeted K12 Computer Science and STEM Education grant is designed to bring high-quality STEM education into elementary, middle and high schools across the commonwealth by expanding access to physical technology and STEM-related curriculum in the classroom. Coding is one of the most crowded categories in edtech. And while there are a ton of great tools for students of any ability level, many of these tools have hit on the same formula. So whether you’re prepping for Hour of Code or looking to launch a coding unit or curriculum in your classroom, lab, or library, it’s tough to find the right solution or even determine what separates one from another. Thankfully, there are a few developers out there breaking the mold and doing something different. What’s the return on investment on a public college president? It’s a complicated question, because the return part of the equation is much more difficult to calculate than the investment portion. A president might raise more revenue than his or her predecessor. He or she might prove particularly adept at improving an institution’s academic standing — or at standing up for academic values. Some presidents just have to clean up the mess left by a predecessor. The University of New Mexico’s STEM Collaborative Center is offering graduate students an opportunity to mentor and encourage children to take an interest in STEM. “Inspire the Next Generation of Scientists” is an amazing opportunity to give back to the community, gain leadership skills, practice professionalism and gain mentoring experience—all of which help build self-efficacy in STEM. A $285,000 grant from the Iowa Governor’s STEM Council will help the University of Iowa expand its STEM Innovator program, which encourages Iowa middle and high school students to become entrepreneurs or consider careers in innovative STEM fields. The grant will allow up 100 additional teachers to participate in the coming years. Since the program began in 2013, STEM Innovator participants have taught more than 62,000 Iowa students about innovation and entrepreneurialism. KinderLab Robotics has released a new curriculum for early elementary grades designed to support education in robotics, coding and computational thinking. “Growing with KIBO – A Progressive Robotics Curriculum for Grades K–2” also offers integration with arts and literacy activities. One of the biggest challenges in my house is trying to pull my sons away from video games and passive media like YouTube, Netflix, and other streaming services. I’m not a monster. I let them have some screen time, but I try to limit it. I’ve found simply telling them to turn off the computer is not enough. I need to have a good diversion. This is where the open-ended play of STEM toys is helpful. Tinkering Labs recently sent me their Electric Motors Catalyst STEM Kit to test. Here are our experiences with it.